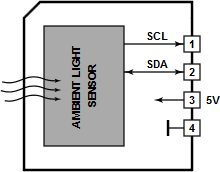 This Tibbit is based on the BH1721FVC ambient light sensor with I2C interface. The sensor is implemented as the C1 device with a clear (transparent) window. The module measures the light intensity of the surrounding environment and its spectral response is close to that of a human eye. 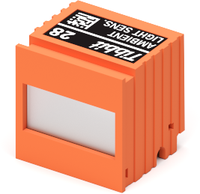 The module outputs ambient light measurements as 16-bit values that do not correspond to any standard measurement units. This C1 device requires the Tibbit #00-3 to be installed in the neighboring "M" Tibbit socket. #00-3 provides two direct lines for I2C comms, as well as the ground and +5V power for the BH1721FVC IC. The use of this Tibbit is illustrated by a Tibbo BASIC test project. Yo can find it here: https://github.com/tibbotech/CA-Test-Tibbit-28.